Deze Iztaccihuatl-vulkaanwandeling is een must voor outdoorliefhebbers die Mexico-Stad bezoeken. Een ervaren gids maakt je klaar van start tot finish op deze avontuurlijke dag. Trek 3 uur lang over een tussenpad dat eindigt op een paar duizend voet onder de besneeuwde top van 17.000 voet hoog. De lucht mag daar dun zijn, maar de uitzichten zijn niet - genieten van een prachtig uitzicht op Popocatepetl en de Vallei van Mexico voordat je de slapende vulkaan afdaalt en met de lunch opvult (op eigen kosten). Nadat je bent opgehaald bij je hotel in Mexico-Stad, ga je met je gids ongeveer twee uur ten oosten van de stad in de buurt van de basis van de slapende Iztaccihuatl-vulkaan. Je verbrandt nog wat calorieën, dus neem het ontbijt (op eigen kosten) voor je op reis gaat door de Vallei van Mexico, een hoogvlakte in de trans-Mexicaanse vulkanische gordel en de bergpas van Paso de Cortés, voordat je uitstapt bij La Joya. Begin je wandeling naar Iztaccihuatl-vulkaan, beginnend op een hoogte van 12.000 voet (3700 meter). De vulkaan wordt ook wel 'The Sleeping Woman' of 'White Woman' genoemd voor de vier besneeuwde toppen. Hoewel er verschillende routes zijn die uiteenlopen in moeilijkheidsgraden, neemt je gids een gemiddeld parcours af dat zowel beginners als mensen met meer wandelervaring zullen waarderen. Afhankelijk van de leden van je groep kun je opstijgen tot een hoogte van 13.800 tot 15.800 voet (4.200-4.800 meter) en verleidelijk dichtbij de besneeuwde toppen en gletsjers komen. Nadat je op adem bent gekomen, kun je genieten van het uitzicht op de vallei van Mexico beneden, evenals de actieve vulkaan Popocatepetl, ook bekend als 'Smoking Mountain', ten zuiden van Iztaccihuatl. Geniet van de tijd op de top om foto's te maken en geniet in het algemeen van de rust van de bergtop. Wanneer je klaar bent, maak je afdaling en stap dan in je transport om te genieten van een lunch (op eigen kosten) met opties zoals tamales, quesadillas, birria (gekruide vleesstoofpot) of andere smakelijke gerechten. Aankomst in uw hotel in Mexico-stad in de avond, met veel opscheppen om te delen. This was a very good trip! The guide was helpful and knowledgeable, and the views from the hike were incredible. Just a warning - it is very steep and vigorous, so be prepared to feel out of breath, and to fall. Overall, it was very worth it! Great trip for young people! The hike will be a lot easier with boots, hiking poles, and pants! Need to be moderately fit to get all the way up! The Iztaccihuatl Volcano hiking tour was well organized and was about a 2 hour drive each way. The hike itself was intermediate, and very doable by people of different fitness levels as the pace was set by the group. Except for one short steep section, the hike was a medium gradient climb 3km up. The scenery on the hike was not what I expected - it was very green and pretty, no volcanic rocks. I would not have known this was a dormant volcano if not told so. Our tour guide was good with limited English. I read some negative reviews before my hike but in the end my experience was pretty positive. I think it all depends on who your guide is. We had our hike with Gerson and he was really nice and he managed everything well. I'm a mediocre hiker and I would say this is a low to intermediate level hike if you're a regular hiker. However the elevation can possibly add some more difficulty. Our group had 7 people in total, 2 gave up after the first 30 minutesnot too far from the trail head, and the other 5 made to the 3rd gateabout 4400m, just below the snow line. It's cold and windy up there in the mountain so be well prepared. Challenging hike up if not reasonably fit- but rewarded with great view of the volcano when you reach the top. All arrangements for pick up and transportation were easy and comfortable. Interesting lunch stop at a roadside stand on our return. Would recommend. Awesome tour and tour guide! I do recommend that you train some what before taking this tour. I'm some what athletic and this climb was doable but tough. But it was worth it in the end! The main attraction itself is great: a hike of roughly four hours on the inactive Iztaccihuatl volcano, with spectacular views of the neighboring active Popocatepetl volcan. Unfortunately, many things went wrong during our trip, and suggest that Amigo Tours, the operator, are not very competent. Although our voucher promised transport in an air-conditioned minivan which suggested a group size of around 10, or multiple minivans if the group was larger in fact we were picked up by bus, and the group was 30 people. The actual hike starts at a parking lot at the point known as La Joyita. However, a tour bus cannot reach this spot, since the road is so bad. As a result, we were taken to El Paso de Cortés, roughly 8 kilometers away. We would have had to hike the 8 kilometers to get to the trailhead, so our tour guide proposed for us to pay 50 pesos each to be transported there on the metal floor of a cargo van. A majority of the group was in favor of this idea, so we piled into the back of the van. Imagine 15 adults crammed together, sitting on the metal floor of a cargo van. It was by far the worst transportation I have experienced in twenty years of backpacker travel in Mexico, extremely uncomfortable and extremely unsafe. My companion and I chose to hike the 8 km back rather than repeat the experience. In addition to the discomfort and inconvenience in the organization, Amigo Tours provides no information about the rigors of hiking at high altitudes. This was not a problem for us, since we are relatively experienced hikers and mountaineers, and took normal precautions carb loading, drinking lots of water, bringing appropriate shoes and clothing, prophylactic doses of aspirin, etc. However, some travelers showed up in shorts and Birkenstock sandals for a hike that started at 3990 meters. Depending on the time of year, it can be very cold on the mountain, and hikers would need layers that shield them from wind. Bringing hiking poles would be a good idea, because the descents at between 4500 and 4200 meters are on paths of loose volcanic dirt with lots of loose rock that is quite slippery. Despite the fact that Amigo Tours apparently operates this tour year round and multiple times per week, they do nothing to prepare their customers for the actual rigors of the hike. 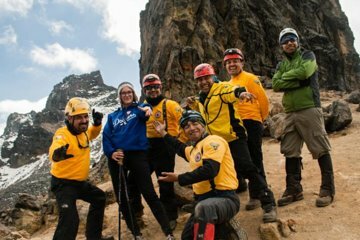 I would guess that at least 30 of the participants suffered from altitude sickness during or after the trip. This is something that can hardly be avoided, since no one can really know what effect high altitude will have on them in advance. However, our guide had an extremely laissez-faire attitude toward the effects of altitude sickness, simply repeating at various points that, If you don't feel like going any further, just stay here. Although he did repeatedly insist that hikers let him know immediately if they felt bad, he should also have been able to explain the symptoms of high altitude and to explain the importance of not exerting yourself more or going any higher if you experience any of those symptoms. I live in Mexico City at 2440 meters. Despite the precautions that I took, I experienced relatively bad altitude sickness during the bus ride home. I definitely do not blame the tour operator for this, I knew it was a risk, since I had previously hiked the Iztaccihuatl. I would guess that the risk of altitude sickness would be greater for people who have just flown to Mexico City from sea level. I have to admit that despite the negative sides of this tour, I am still glad I went. The landscape is spectacular. I took a friend who was visiting from Germany who had long dreamed of getting close to Mexico's volcanoes. Once you know where it is, it would not be hard to drive to La Joyita, you could probably arrange a taxi ride there from Amecameca, the nearest town. The taxi driver could certainly be paid to wait for you while you hiked up the mountain there is only one path, and maps are posted at the trailhead. It is very important to listen to your body while doing this. One family brought a child along, and I would have liked to bring my 9-year old son, but in the end I am glad I didn't. Altitude sickness was miserable for me, and it would have been awful for a kid and perhaps soured him on the mountains for a long time. 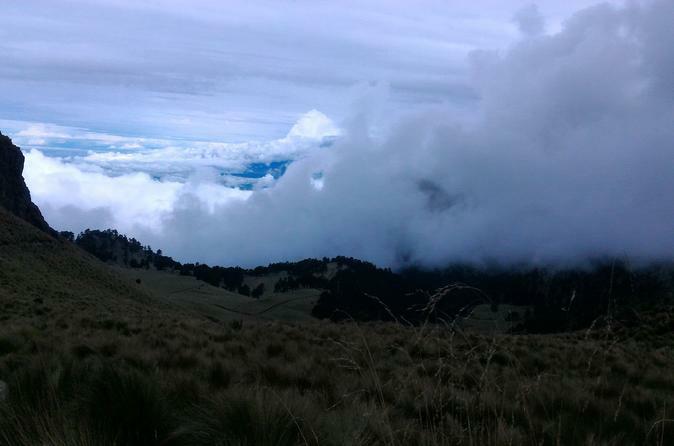 To sum up: go hiking on Iztaccihuatl if that is something that you want to do, and if you are well-prepared. Consider a different tour than the one offered by Viator through Amigo Tours. The climb was enjoyable. The tour was a large group and not well managed to do the trip at a reasonable pace. Several people had to wait an inordinate time for others to finish. Every thing was good. Amazing views, good service from local tour operator. The actual climb was beautiful once you get to the first resting spot. Its tougher than you think. Issues were poor communication from the guide. No one really knew what was happening and how far we were going. The 2-3 hour drive to the volcano was in a very uncomfortable van with tiny windows. Other than that, it was a great experience. I would do the climb again, but with a different tour company.